Aggya or Third eye Chakra : Aggya chakra is the 6th chakra and its situated at our forehead or centre of command or the place of third eye of the Shiva. The third eye chakra is located in the brain, directly behind the eyebrow center at the top of spinal chord i.e at the medulla oblongata. There are only two petals of the lotus in this chakra. On the left petal is the letter ham which represents the moon or the ida nadi and on the right petal is the letter ksham which represents sun or the pingla nadi. Within the lotus is a perfectly round circle that symbolizes the shoonya or the void i.e the state completely devoid of ego. In this circle the symbol Om is written. ‘Om’ is the mantra and the symbol of aggya chakra. The third eye or Aggya chakra is the point of meeting of the three main nadis – ida, pingla and sushumna. Here these three nadis merge into one stream of consciousness and flow upto sahasrara or the crown chakra.It convert the main prana into five types of sub pranas, reflect and distribute the sub pranas to different parts of the body organs through other chakras as per their requirement. Aggya chakra is like the power supply part of the personal computer, which converts the 240v main current into other currents at different voltages as per the requirement of the computer parts. It is related to pineal gland and takes care of all the functions of the body. Yogi acquires all the 8 major and 32 minor siddies at this chakra. The yogi becomes a liberated soul in his lifetime. He gets the Moksha & the liberation of soul. The ego I still exist at Aggya chakra. 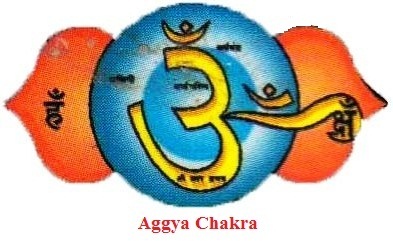 Beej mantra of the Aggya chakra is the AUM or OM. When you develop aggya chakra you can gain knowledge without the aid of senses. Generally, all knowledge that we have gained is through the information that senses conducts to the brain, and a process of logic and intellect takes place in frontal brain. When aggya chakra is awakened and start to operating, then you will develop superior perception and the pathway to reach sahastrara will become clear to you and you will reach easily at the Sahastrar or supreme chakra in body. This entry was posted in Smart astro guru, Yoga & Kundalini Shakti and tagged Aggya chakra, aggya chakra in kundalini shakti, aggya chakra in the body, obey chakra, third eye chakra by R. N. Sharma. Bookmark the permalink.